The Hitchcock chair is a true American original. It was designed by one man, intended to be mass-produced, and came to stand for an entire genre of chair. This chair style takes its name from its creator, Lambert Hitchcock (1795-1852). This Connecticut cabinetmaker settled in Barkhamsted, a small town in the northwestern corner of the state, in 1818. There he began making chair parts for shipping and assembly. By 1820-21, he put into operation a bigger plan: the manufacturing of entire chairs. Not hand-made, but created on an assembly line, using standardized patterns and components, in the tradition of the burgeoning Industrial Revolution. 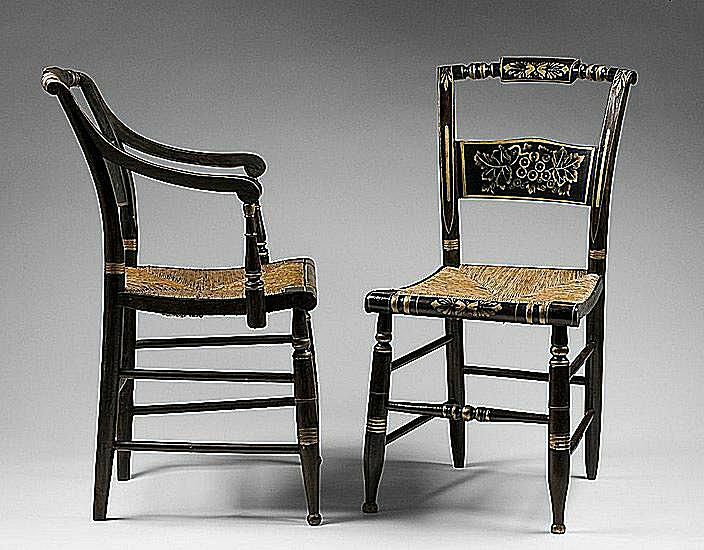 Painted dark (instead of using dark polished woods) and stenciled (instead of carved or inlaid), they were indeed fancy chairs for ordinary people. The small, light chairs were a hit, selling up and down the Eastern seaboard and into the interior of the rapidly growing young United States. By 1825, Hitchcock had moved to a bigger factory, one that employed 100 people. In its heyday, throughout the 1820s and 1830s, the company produced up to 300 chairs a week, which equates to about 15,000 a year. The town even changed its name to Hitchcocksville in honor. Hitchcock's company - which was reorganized in 1832 as Hitchcock, Alford & Co. - actually produced chairs in several varieties and colors, along with settees. But the quintessential Hitchcock chair was basically a Sheraton style piece with the characteristic rectilinear silhouette, round legs, and Neoclassical motifs updated with American Empire touches, such as a sloped back and curved back rail (not unlike its contemporary, the revived klismos chair). Most pieces were painted black or brownish-black (imitating ebony) or a very dark green. Elaborate designs were then stenciled onto the back and sides in bright metallic colors (golds, blues, reds, whites), and a bronzing finishing coat was applied overall. The end product had a fresh, gleaming quality - very bright and happy - which appealed to consumers of the day. With success came imitators, and over time, a "Hitchcock chair" began to mean any painted and colorfully-stenciled chair that roughly resembled the originals - that is, medium-back in height and largely square in shape. Chairs dating 1823-43: "L. Hitchcock Hitchcocks-ville. Conn. Warranted." Hitchcock died in 1852. His old factory in Hitchcocksville (now Riverton) fell into disuse. Then, in 1946, it was taken over as the site of the newly formed Hitchcock Chair Co., whose mission was to reproduce the original furniture; later, it began producing some variations. This company ceased operation in 2006. Its pieces were stamped with a combination of the old stencils, with the signature "L. Hitchcock Hitchcocks-ville. Conn. Warranted. ", using the backwards "n"s, and adding the ® trademark symbol and an "HCCo" stamp. Back in the 19th century, Hitchcock chairs sold for $.50 to $1.50. Today, prices are a bit higher, with chairs from 1825-43 - the time frame of Hitchcock's original companies - fetching the most: $200-300 for a signed, single chair in good condition, $1,200 for a set of four. Pieces with more unusual stencils often go higher. Some of the works produced by the later Hitchcock Chair Company have collectible status too, especially commemorative models or those made in the 1940s and '50s.